Rating: 5.5/10. From 33 votes. 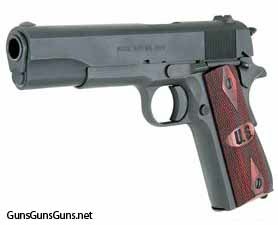 Summary: The description, specs, photos, pricing and user ratings for the Auto-Ordnance 1911PKZSEWMA pistol. The Auto-Ordnance 1911PKZSEWMA is a WWII-style 1911 pistol chambered in .45 ACP. 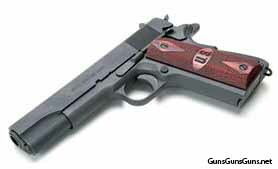 It features checkered wood grips (model 1911PKZMA features brown, checkered, plastic grips). It also includes a notch machined into the top of the barrel hood to act as a loaded chamber indicator, which makes it Massachusetts-compliant. I purchased this gun last week and finally got to the range with it. The only bad thing I can say about it is that it only came with 1 – 7 round magazine. I purchased 4 more off of Ebay for $12.00 each and 4 – 8 round magazines for $27.00 each. It’s a 1911 so magazines are plentiful and inexpensive. Anyway I loaded them all up and shot all 9 mags without a glitch. I hadn’t planned on loading them up again because I really just wanted to see how it handled but it the trigger pull )Out of the box) was so smooth and the gun was so accurate, I felt I had improved tremendously. I loaded all nine magazines back up and went through them before I knew it. It is a beautiful gun, very accurate (I am a below average shooter) I was grouping my shots like an expert. This is definitely a keeper. USA. Its a high quality firearm with beautiful detail. Its machine and manufactured right here in the USA and the price is great. I brought it to the range and it shot better than my higher priced pistols. The grouping was tight and the feed was flawless. I could not have been any happier with the purchase. NOTE: If you buy a AO M1911A1 used its best to avoid the older AO – Non Kahr Arms product as the quality just was not there. I highly recommend this pistol.